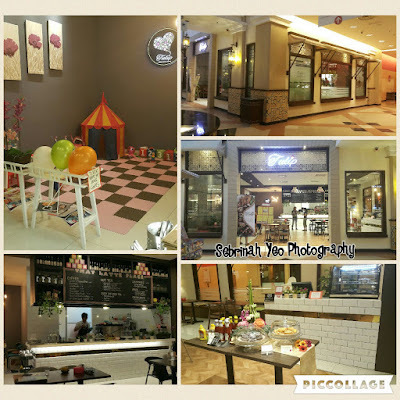 Tulip by That Latte Place located at Marrakesh Lane, Sunway Pyramid started out as a breakfast place. 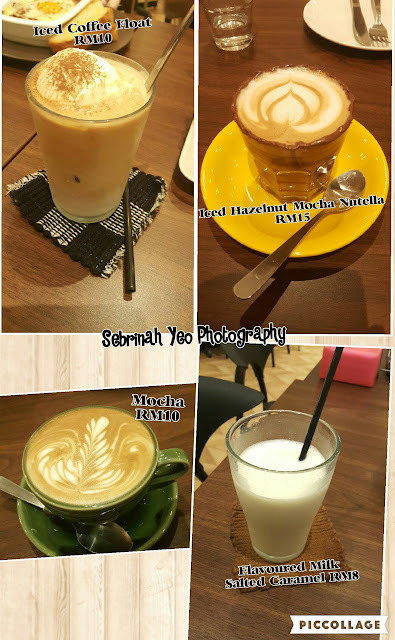 Their first outlet at That Latte Place has expanded their operation since they started and have recently opened a café in Sunway Pyramid 4 months ago named "Tulip by That Latte Place". 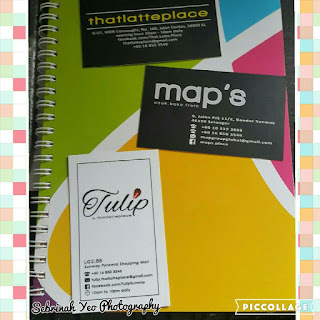 Tulip was officially opened on 9th December 2016, and the café is located along the Marrakesh Lane in Sunway Pyramid. Both the owners – Priscilla and Marc did not want to run too far away from coffee theme. Hence they use the name “Tulip” which is a reference to the "Tulip latte art". Also, the name co-exists with "That Latte Place" taking the first 3 letters and adding U & I in between and is now known as "TULIP". The owners stayed true to their laid back and casual concept at Tulip, and have also allocated a kid-friendly corner so that the parents can dine at ease while their little ones are having fun! 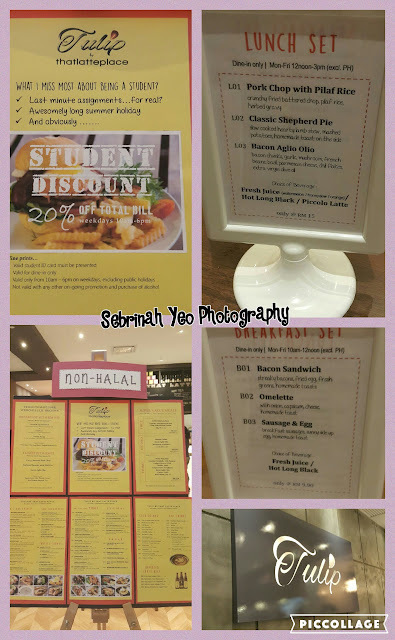 There's an on-going discount of 20% for students on weekdays from Morning to 6pm and also 10% for Sunway Group staffs to dine-in anyday. Besides that, they have weekdays set lunch and set dinner. Weekends are value meal sets. And their set of variety changes every month! Iced coffee float was really interesting, has that milky taste from the ice cream that blended well with the aroma of the coffee. Iced Hazelnut Mocha Nutella and Mocha was pleasantly not too sweet and just right. Flavoured Milk Salted Caramel was definitely a new twist in flavour! Was not too bad even though I dislike drinking milk, but this was acceptable for me. Apparently, the coffee blend here versus their first outlet in That Latte Place in Cheras is ~rest-assured~ of the same coffee blend! Only difference is this outlet here in Sunway will have a more unique and different preparation. 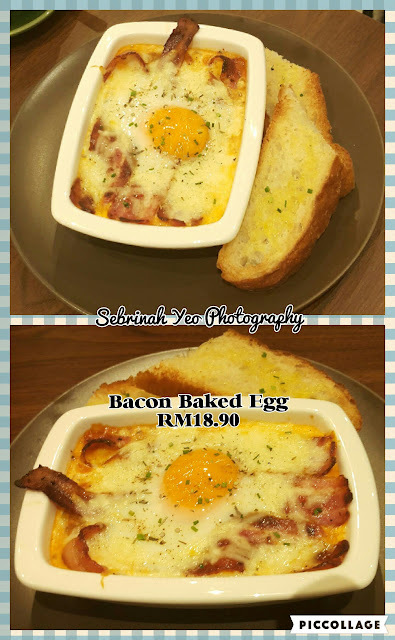 The Bacon Baked Egg was simply amazing! If I weren't expecting, I would've licked the bowl clean!! However, I can't... Can only have a taste and sight of the runny eggs that was practically oozing in that bowl of bacon!! (Urghh,.... torturing....) I'll definitely bookmark this and will immediately be back for this after I delivered my 2nd baby and after confinement~duh! 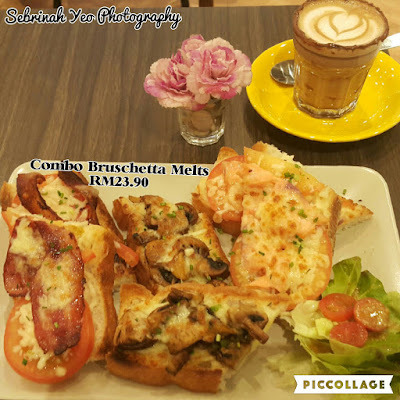 Combo Bruschetta Melts was interesting. Great as starters for the family. A very healthy combination of some salad at the side and from the left is oven baked bacon on tomato with cheese followed by mushroom baked cheese and salmon baked cheese on the bruschetta. My son loved it! Because of the cheese and bread. Signature Pork-Chetta is a definite MUST-TRY! It's not like some homemade siu yuk where the combination of the salt and poking to skin plus air-frying or baking it in the oven (making your whole kitchen smoky or smell smoky) goes haywire! (I tried it before, decided to never homemake this again) This Pork-Chetta is definitely mouth-drooling and food-worthy! Crispy, succulent, tender and just pure satisfaction! And this is first come, first serve! Because Pork-Chetta needs more than half a day to slow roast the pork and everyday they only have about 2 to 3 rolls ready to be served;Where 1 roll of Pork-Chetta can deliver 5 to 8 slices only! Oh-My-Rib! 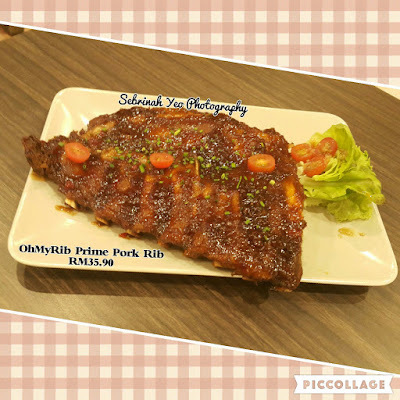 Prime Pork Rib is another one you must-try if you're with the whole family or a bunch of friends! It's not like eating at Morganfield's. It's definitely different, more homemade like even the sauce is different. But it is well blended and just a match made in heaven! (I meant the sauce + rib + the way it ismade and taste) These are made out of organic pork ribs, spices and sauce (orange and lemon herbs blended with BBQ spices) made in house!! 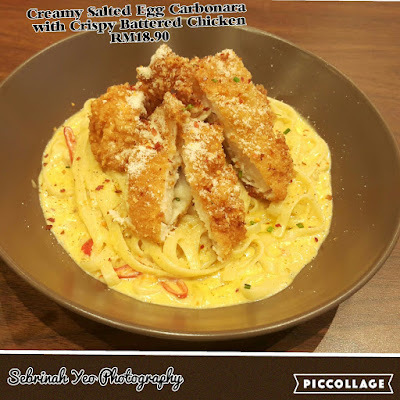 Creamy Salted Egg Carbonara with Crispy Battered Chicken is one meal that will make your whole life complete! Okay, enough said! MUST MUST MUST-TRY! 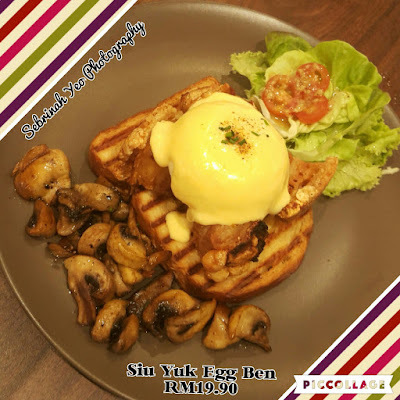 There's also another new dish on their menu called the "Salted Egg Crispy Sandwich". 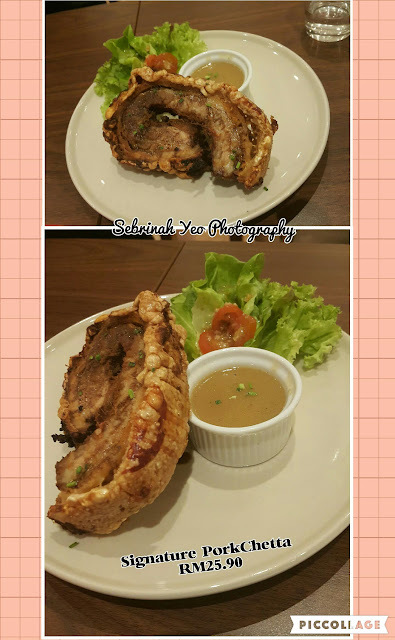 They said it's made with deep fried pork with salted egg and then they sandwich it together, then it goes into the deep fryer! Would love to try this too after my confinement! 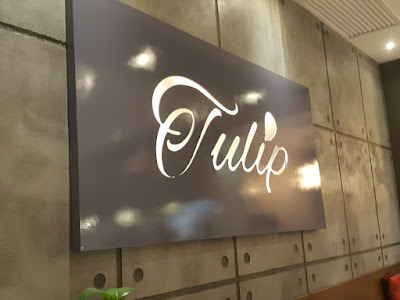 To ensure their customers have the best experience, Tulip insist of making everything from scratch, be it the sauces (with fusion of asian spices) they use or the patties and bread they serve. If you are looking for a perfect spot that is cozy to rest your legs and fix your hunger after a whole day of shopping, drop by the friendly and homey Tulip by That Latte Place to enjoy their homemade dishes. Don’t forget to follow their Facebook page and Instagram for more updates too.